Mahendranath Gupta (Bengali: মহেন্দ্রনাথ গুপ্ত) (14 July 1854 – 4 June 1932), (also famously known as শ্রীম and Master Mahashay), was a disciple of Ramakrishna (a great 19th-century Hindu mystic) and a great mystic himself. he was the author of Sri Sri Ramakrishna Kathamrita (5 vols. ), a Bengali classic. He was also a teacher to Paramahansa Yogananda, a famous 20th-century yogi, guru and philosopher. In his book, Paramahansa Yogananda has highlighted his life in an amazing way. He considered himself as the child of Kali. Mahendranath was born to Madhusudan Gupta and Swarnamayi Devi in a Vaidya-Brahmin family in the Shimuliya section of Calcutta of West Bengal. After elementary education at the Hare School, he attended Presidency College, receiving his B.A. in 1874. Gupta was a gifted student and performed consistently well until 1874 till he graduated from Presidency College. In 1874 he was married to Nikunja Devi, daughter of Thakur Charan Sen and a relative of Keshub Chunder Sen, a Brahmo Samaj leader. After some time working for the government and a merchant house, he began teaching English, Psychology, and Economics at various colleges. Eventually he became headmaster of Ishwar Chandra Vidyasagar's high school, where he was called "Master Mahashay"—just as he was often addressed in Ramakrishna's circle and later by Yogananda. 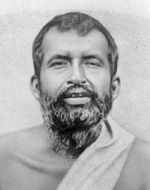 As an adult, Mahendranath, like some of the other disciples of Ramakrishna, was connected with the Brahmo Samaj for several years. Mahendranath had lost his mother at a very early age and was experiencing domestic friction in the joint family. As the friction within the joint family increased, Mahendranath decided to commit suicide. At this critical juncture, Mahendranath's nephew took him to the temple garden of Dakshineswar Kali Temple, where Ramakrishna, a mystic and the chief priest of the Kali temple lived. It was here that Gupta met Ramakrishna for the first time and this meeting was a turning point in his life. Years later, when Mahendranath was asked about the greatest day in his life, he said, "the day I had my first darshan of Thakur [Ramakrishna] in February 1882." According to other traditional accounts, Mahendranath related that he may have met Ramakrishna for the first time when he was four years old and became separated from his mother while visiting the Dakshineswar Kali Temple. He began crying, and a blissful and youthful man came up and consoled him. He believed it to be Ramakrishna, who was then a priest at the Kali temple. I wrote everything from memory after I returned home. Sometimes I had to keep awake the whole night...Sometimes I would keep on writing the events of one sitting for seven days, recollect the songs that were sung, and the order in which they were sung, and the samadhi and so on...Many a time I did not feel satisfied with my description of the events; I would then immediately plunge myself in deep meditation ...Then the correct image would arise...That is why in spite of the big gap in the physical sense, this story remains so fresh and lifelike in my mind as if it happened just now. In each of his Kathamrita entries, M records the date, time and place of the conversation. The title Kathamrita, literally "nectarine words" was inspired by verse 10.31.9 from the Vaishnava text, the Bhagavata Purana. Both Sri Ramakrishna's wife, Holy Mother Sarada Devi, and Swami Vivekananda later testified to Mahendranath's faithfulness to Sri Ramakrishna's words. The first four volumes were published in 1902, 1904, 1908 and 1910 respectively and the fifth volume in 1932, delayed because of M's health problems. The Kathamrita contains the conversations of Sri Ramakrishna from 19/26 February 1882 to 24 April 1886, during M's visits. The Kathamrita is regarded as a Bengali classic and revered among the followers as a sacred scripture. Famous translations of Kathamrita include works by Swami Nikhilananda(1942), and Dharma Pal Gupta. His role in the world was humble, as befitted the greatest man of humility I ever knew. In this Amherst Street house, Master Mahasaya conducted a small high school for boys. No words of chastisement passed his lips; no rule and ferule maintained his discipline. Higher mathematics indeed were taught in these modest classrooms, and a chemistry of love absent from the textbooks. He spread his wisdom by spiritual contagion rather than impermeable precept. Consumed by an unsophisticated passion for the Divine Mother, the saint no more demanded the outward forms of respect than a child. Yogananda went on to describe several seemingly miraculous experiences with Mahendranath. Later, Yogananda said about him that "I would roll on the ground where he'd walked, so great was my love for him. I felt that even that ground had been sanctified." In 1932, when the fifth Volume of Kathamrita was at the printers Mahendranath died at his home, now called Kathamrita Bhavan, located near the Thanthania Kali Temple in Calcutta. Kathamrita Bhavan is a pilgrimage place for followers of Ramakrishna due to numerous visits there by Ramakrishna and Sarada Devi, and several relics associated with their lives. ^ "M. (Mahendra Nath Gupta)". Sri Ramakrishna Sri Ma Prakashan Trust. Retrieved 17 March 2008. ^ "Publisher's note". Kathamrita Bhavan. Archived from the original on 26 February 2002. Retrieved 21 August 2010. ^ "Kathamrita Bhavan". M's Thakurbati. Retrieved 18 March 2008. Chetanananda, Swami (1990). Ramakrishna as We Saw Him. Vedanta Society of St. Louis. ISBN 0-916356-65-5. Nikhilananda, Swami (June 1985). The Gospel of Sri Ramakrishna. Ramakrishna-Vivekananda Center. ISBN 978-0-911206-01-2. Kriyananda, Swami (2004). Conversations with Yogananda. Crystal Clarity Publishers. ISBN 1-56589-202-X. Smith, Bardwell Leith (1982). Hinduism: New Essays in the History of Religions. Brill. ISBN 90-04-06788-4. Yogananda, Paramhansa (2005). Autobiography of a Yogi. Crystal Clarity Publishers. ISBN 978-1-56589-212-5. Dasgupta, R.K (June 1986). Sri Sri Ramakrishna Kathamrita as a religious classic. Bulletin of the Ramakrishna Mission Institute of Culture. Sources of Biographical Information about M.